The Old Mandir will not be forgotten. Many hearts were transformed there. However, it was found to be inadequate to house the ever-increasing number of spiritual seekers. Devotees prayed to Baba to agree to the construction of a spacious building that Baba named ‘Prashanti Nilayam’, the Abode of Highest Peace. 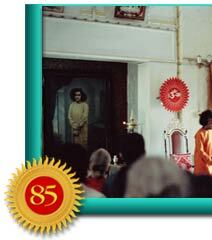 This was inaugurated on November 23, 1950 to coincide with the 25th birthday of Bhagavan Sri Sathya Sai Baba. It took about two years to build. Baba can be hailed the architect and engineer who directed the construction. His suggestions were found by the engineers to be much better than their own. They recognised Sai Baba had a greater sense of perspective and a finer aesthetic point of view. Baba’s Grace overcame the most insurmountable obstacles. For example, huge heavy girders for the central prayer hall awaited in Penukonda, a town some 50 kilometers away from Puttaparthi. 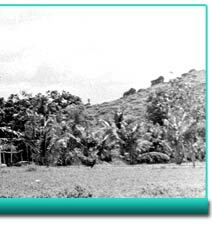 The engineers wondered how to bring them through primitive roads and river beds to Puttaparthi. Giving up all hope, they asked Baba for alternative proposals for roofing the prayer hall. Baba’s intervention came through in an intriguing manner. One night, in the small hours, the chief engineer was awakened by a loud noise in front of his house at Anantapur. He peered into the darkness and was surprised to find a crane from Tungabhadra Dam Works, a massive government project, put out of action and unable to move. He ran to Puttaparthi and told Baba that if only the crane was made operational could the owner be persuaded to travel up to Penukonda and bring the girders to Puttaparthi. Sai Baba materialised some Sacred Ash and gave a small quantity to the engineer who scattered it over the engine of the crane and asked the driver to make efforts to set it going. With a grunt or two, the engine started, the wheels turned, and the crane moved - towards the girders! Lifting them with its giant arms, it somehow passed over all culverts, turned acutely around corners, lurched over slush, and puffed up the Karnataka Nagapalli hill. There, the engineer said its strength was nearly exhausted. It could not possibly draw all that weight through the sands. So Sai Baba Himself sat near the driver and handled the wheel, and the crane unloaded the girders near the work site. The grumbling of the engineers did not stop with this achievement. In fact, they became even more exasperated and muttered: "Of what use is all this trouble when it is humanly impossible to hoist them on the walls?" Little did they know that where there is Divine will, there is a way. Labourers were brought from the Tungabhadra Dam, ropes were fastened, and pulleys were rigged up. 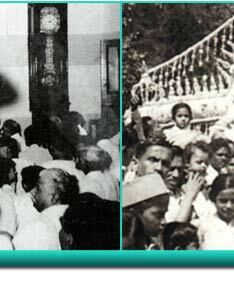 In order to make the girders lighter, each one was pulled up amidst shouts of "Jai Sai Ram!" which means “Victory to Sai who is Rama!” The chant arose from the throats of hundreds of devotees, all in the Presence of Sai Baba. Finally, the girders were set in place and all went well. The central prayer hall with platforms ensconced on either side is the main part of Prasanthi Nilayam. On the westerly platform is the shrine where two life-size oil portraits are placed leaning against the wall, one of Sai Baba of Shirdi, and the other of Sri Sathya Sai Baba. 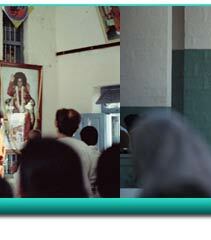 There is also a silver figure of Sai Baba of Shirdi in the centre and a small portrait of Sathya Sai Baba under it. These are kept as aids for meditation and the chanting of God's Name. 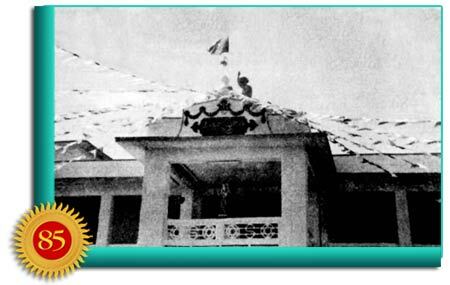 Ever since its inauguration in 1950, the day begins at Prashanti Nilayam with the ringing of the prayer hall bell at 4:30 a.m.
At 4:45 a.m., the singing of Om starts in the hall and continues for about half an hour, followed by Suprabhatam, the early morning prayer to awaken the divinity within us. Alongside, Vedic hymns are also chanted, followed by Nagar Sankirtan or the collective singing of God’s glory while walking along the streets of the ashram. Since those early days, the ashram has an evening routine of bhajans or congregational singing of the Lord’s name or spiritual talks and cultural programmes – all centered on uplifting the thousands of seekers to higher states of divine bliss. 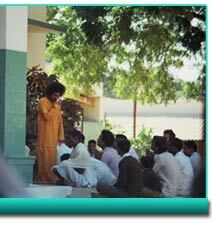 Some who come to Prasanthi Nilayam are fortunate to gain an interview with Sai Baba. The Divine Physician diagnoses the ills of the supplicant and lays bare the innermost blemishes of character or conduct with the utmost kindness, applying the soothing balm of His Grace for the prescription of appropriate remedies. 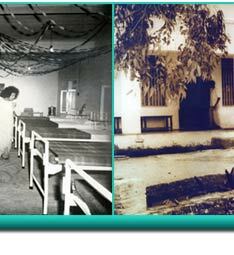 The Interview Room at Puttaparthi has been the scene of countless transformations of character, revolutions of belief, confirmation of faith, curing of disease, calming of temper, discarding of hatred, salvaging of souls, and reunion of hearts. Seldom does a devotee leave the interview room with a dry eye. The prayer hall has served as the epicenter of divine energy for decades. Up until the year 2007, the songs of love for God were sung in the prayer hall creating an atmosphere of serene reverence. Baba Himself was generally present in the hall at such times. And these songs are not all about Sri Sathya Sai Baba or His previous incarnation as Sai Baba of Shirdi. They cover the widest possible range of the truths of the various manifestations of God through the ages and are drawn from multi-faith traditions and sung in different languages. Emphasis is on the meaning and the "emotion of surrender”. They are sung in unison and to the correct marking of time. 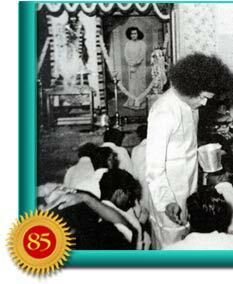 Sai Baba has often expounded on the loud singing of the Lord's Name in unison as an act of service to others. He has compared the enthusiastic clapping of the hands in time during bhajan singing to the clapping of hands under a crow-infested tree in order to frighten the birds away! The crows here refer to the negative thoughts that can be rid of with fervent singing and clapping. Baba exhorts everyone to engage oneself in the repetition of the Name of the Lord. Any Name that appeals to the individual is, in His eyes, as good and effective as any other. 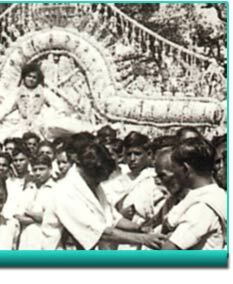 With the inauguration of Prashanti Nilayam in 1950, the calendar of festivals assumed a more formal resonance. On Deepavali Day, the Day of Victory over the Forces of Evil, Baba took delight in firework displays. On Dussera, the festival celebrating the triumph of right over wrong, worship of God by all women devotees would begin at noon and performed twice daily during the ten days. The second day was set apart for social work by the devotees - repair of the approach road and cleaning of the place where the poor were to be fed on a subsequent day. In the evening, the devotees listened to discourses by Sai Baba about the need for doing Karma, that is, activity suffused with selfless love and nourished by devotion. The third day would be marked with Children's Day complete with sports and fancy dress, drama and recitations by children. Sai Baba made all the children happy and encouraged them to proceed when they forgot their words, caressing them into confidence. On the fourth day, the Poets' Assembly would be held in the immediate presence of Baba. Poets from far and near would recite in diverse languages such as Telugu, Tamil, Sanskrit, Kanada, and English. Baba blessed the thousands of devotees who would visit the ashram during this festival with His discourse on two or three days, thus giving them spiritual sustenance to draw strength from. The sixth and eighth evenings were devoted to devotional singing. On the seventh day, the poor were fed and clothes distributed to the maimed and destitute. The young Sai Baba appeared the happiest that day, which would invariably turn out to be His busiest day. Ever His detail-oriented self, He would examine the kitchen and food preparation, and Himself supervise the seating arrangements. Bending before the outstretched leaves, He would personally serve the sweets and distribute clothes to almost everyone. He had a kind word for every person and treated the blind, the maimed, the very old, and the faltering with special consideration, asking the young to aid and guide them. He advised them to be careful and cautious in the dark and fashioned kind enquiries about them. He really made the moment precious to everyone. His disposition reflected the perfection that human nature has the potential for. The other days of the Dussera festival were devoted to music recitals, vocal, instrumental, or orchestral. Many musicians competed for the privilege of appearing on these festival days, because Baba Himself is the Great Musician who sings in a captivatingly charming style. Leading exponents of music would be eager to win His blessings. Since 1950, Shivaratri came to be celebrated at Puttaparthi. 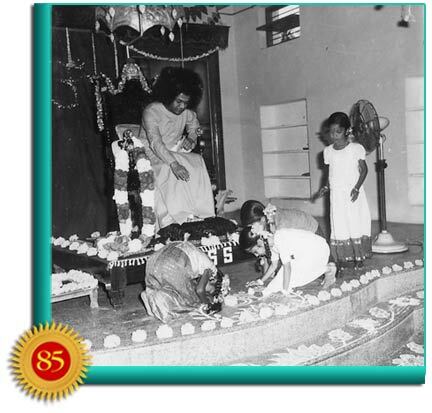 During those days, while the devotees performed all night vigil with prayers and songs, a profusion of Ash emanated from the young Sathya Sai Baba's hands, forehead, toes, and face. On many years, Sivalingams have materialised within His Body. By now, the chosen Mother Easwaramma was beginning to accept that her dear son Sathya, whom she now addressed as ‘Swami’ like the many devotees around Him, was destined for things no one in the village had even dreamt of. She had witnessed enough unprecedented events to approach him for help with a concern. The village women had no primary medical facilities in the area, causing great inconvenience to expectant ladies. Mother’s wish proved to be Sai’s command. 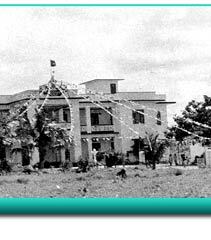 In October 1957, a hospital was inaugurated on the hill behind the Nilayam. 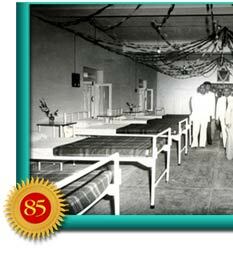 It contained six beds for female and male patients each, a full complement of equipment for surgical and maternity cases, and a room complete with an X-ray unit. 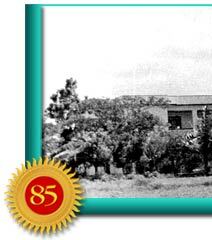 It commanded a magnificent panorama of surrounding mountains that swept to the very banks of the Chitravathi River. Baba chose the site in spite of protests of engineers, because as He said, the patients would be inspired by the Lord's handiwork before their eyes. He got bulldozers, cut and leveled three terraces where there was once a rocky side of a hill, and planned the hospital on the topmost terrace. Speaking on the occasion of the Foundation Stone Laying Ceremony, He said that everyone, rich or poor, educated or uneducated, pious or not pious, was subject to disease. 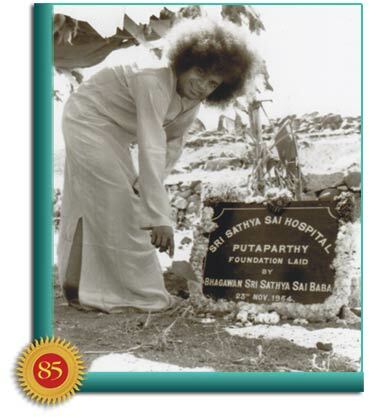 Baba said He planned the hospital at Puttaparthi as there were no good hospitals for miles around, and more importantly, as an example of the service that the Lord Himself performs in order to make man do likewise and thus earn the Grace of the Lord. He also said that those who come to the hospital for their physical maladies will naturally turn to Prasanthi Nilayam for the treatment and cure of their spiritual ills as well. Baba supervised the construction, acquiring of equipment, and watched over the devotees who, standing in long lines along the slope of the hill, passed from hand to hand metal, stones, bricks, water, mud, mortar, and everything needed for the building! On the first annual celebration, the Medical Officer in charge spoke of many miraculous recoveries that had happened through Divine blessings. Baba said it was due to the spirit of love and service with which every stone and brick of the building was saturated. 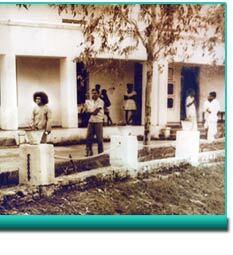 Sai Baba, when visiting the hospital, persuaded the patients to take medicines or undergo injection or surgery. The sweetness of His words and healing influence of His looks hastened their recovery. Baba advised the doctors on the importance of maintaining mental equanimity and physical wholesomeness by the methods of repeating the Divine Name of God and meditation. All treatment, medicines and diagnostic testing were provided free of charge to the patients. Since then this hospital has grown and in the process moved to a slightly more spacious location. Today it is a 100-bed hospital with at least 15 disciplines and serves a minimum of 1000 outpatients everyday. Few knew then that the 12-bed hospital on the hill behind the Mandir was a precursor to a model Sai healthcare system that would draw the world’s attention in just a few decades. 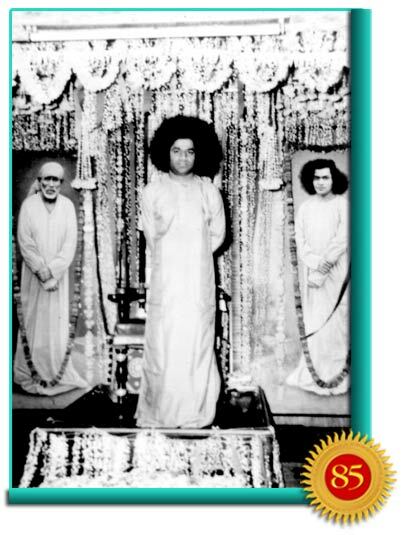 As with everything that He has ever done, at 31, Sathya Sai Baba was making history without any fuss or publicity. He was setting an example of concern for the suffering - one that would inspire millions in years to come. The world was to wait and watch the next divine surprise He would spring upon them.